We are a society based around the love for and preservation of 60's & 70's Reggae and the celebration of personal creativity and uniqueness. 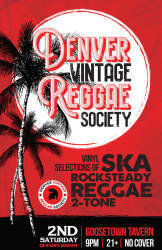 We host a night on the 2nd Saturday of every month at Goosetown Tavern 3242 E. Colfax Denver, CO 80206. These nights are full of Top Notch Vintage Reggae being spun by DVRS Deejays from 9pm-2am! No Cover!